The clip starts with a caption, saying: "A few years ago, I secretly built a shredder into a painting." The video then shows someone in a hoodie installing the device, before another caption, saying: "In case it was ever put up for auction." The video then shows the moment the painting shredded itself at the auction house on Friday, captured on a mobile phone. It is unclear how the shredder was activated. Moments before, the 2006 stencilled spray-painting had sold for £1.042m. 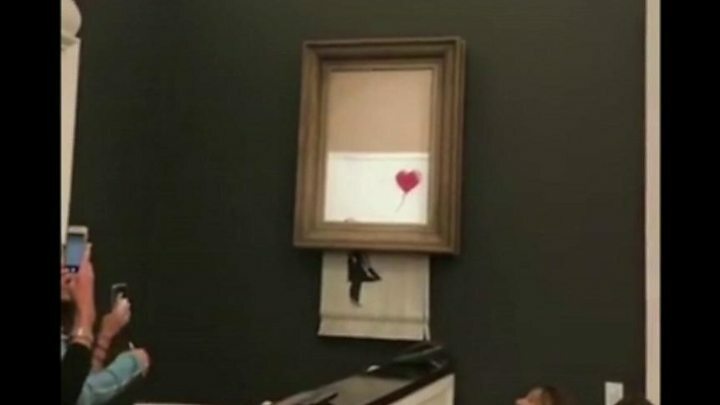 Earlier, Banksy posted a picture of the moment it happened on his Instagram, with the words: "Going, going, gone..."
"He has made Damien Hirst look like an amateur," Mr Brandler said. Banksy rose to prominence through a series of graffiti pieces across the country. The enigmatic artist is thought to have grown up in Bristol, but his identity has remained a secret despite much speculation over the years. Among his recent works was the 2015 opening of Dismaland, a Disneyland-esque attraction at a lido in Weston-super-Mare, which he described as a "family theme park unsuitable for children". In 2017, Girl With Balloon, which originally appeared on a wall in Great Eastern Street, London, was voted the nation's favourite artwork. Does the buyer still have to pay? Sotheby's has not revealed who bought the piece before it was shredded. At the moment it is unclear whether their contract still stands. Mr Branczik told the Financial Times the auction house was trying to "figure out" what the stunt means. He said: "We have not experienced this situation in the past ...where a painting spontaneously shredded, upon achieving a [near-]record for the artist. "We are busily figuring out what this means in an auction context." In a statement on its website, Sotheby's described the incident as "unexpected" and said it had become "instant art world history". Will it be worth more now, or is it ruined? Some social media posters have speculated that the prank could have actually caused the artwork to increase in value. However, others have questioned whether the buyer would still have to pay for it - or would even want to. Mr Brandler said the more publicity works of art get, the pricier they tend to become. "It was the best publicity stunt he [Banksy] could think of," he said.